Summary: This symposium aims to bring together experts across the range of engineering science disciplines to discuss the state-of-the-art in development of 3D/4D printing techniques for various biomedical applications. As an emerging biomanufacturing technique, 3D printing offers great precision and control of the internal architecture and outer shape of a scaffold, allowing for close recapitulation of complicated structures found in biological tissue/organ. It has begun to show great promise in tissue engineering. The symposium will highlight challenges spanning from design of innovative printing systems and printable biomaterials, to fabrication, and to implantation. Computational and analytical challenges will be a special focus. Topics will include but not be limited to: • Computational simulation for 3D/4D printed materials and structures • Simulation of cell-material interaction or 3D tissue constructs • 3D/4D printed tissue and organ models • Advanced additive manufacture techniques • 3D/4D printing for tissue and organ regeneration • Design and applications of advanced printable biomaterials. Summary: This symposium aims to bring together experts across the range of engineering science disciplines to discuss the state-of-the-art in development of vulnerable plaque biomechanics and its clinical application. Atherosclerotic plaque development and rupture are closely associated the plaque mechanical conditions, including hemodynamics and structural mechanics. These mechanical conditions have the potential to improve the assessment the vulnerable plaque and forecasting adverse major cardiovascular events with integration of plaque morphology from multiple non-invasive or invasive imaging technologies. The symposium will highlight the experimental and computational techniques in the vulnerable plaque biomechanical research, and the influence of biomechanics in clinical patient-screening, diagnosis and intervention for atherosclerosis-related cardiovascular diseases. Keywords: Vulnerable Plaque, Biomechanics, Clinical Application. Summary: This symposium aims to bring experts together and provide a platform for exchange of ideas and disseminate the recent developments in Ventricle Modeling, Biomechanics and Clinical Application. The symposium will highlight challenges spanning from heart modeling (including ventricles and valve modeling) to dissect the mechanisms for cardiac dysfunction, cardiac hemodynamics, and cardiac valves. Computational, analytical challenges and clinical applications will be a special focus. Summary: It has become a common practice to combine image based full-field displacement measurements experienced by tissue samples in vitro, with custom inverse methods to infer the best-fit material parameters and the rupture stresses and strains. Similar approaches have also applied to characterize the material parameters of soft tissues in vivo, where advanced medical imaging can provide precise measurements of tissue deformation under different modes of action, and inverse methodologies are used to derive material properties from measured data. Nowadays, these approaches offer important possibilities for fundamental mechanobiology which aims at gaining better insight in the growth, remodeling and aging effects in biological tissues. It is well-known that biological soft tissues appear to develop, grow, remodel, and adapt so as to maintain particular mechanical metrics (e.g., stress) near target values. To accomplish this, tissues often develop regionally varying stiffness, strength and anisotropy. Important challenges in soft tissue mechanics are now to develop and implement hybrid experimental – computational method to quantify regional variations in properties in situ. 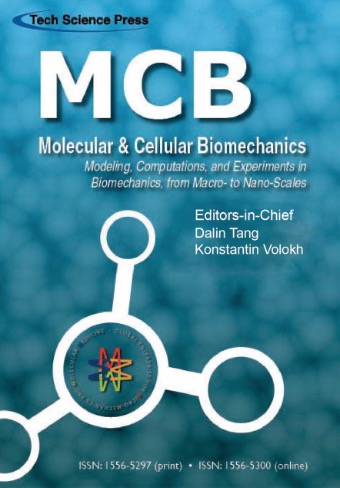 - reliability of computational models for biological tissues. Keywords: soft tissues, biomechanics, tissue properties, mechanobiology, inverse problems, identification, imaging techniques. Summary: In the last few years, we are thrilled to witness countless international collaborations in the field of biomechanics, which placed the proposed joint symposium at a most appropriate position to contribute to building a tightly-bonded biomechanics international community. This symposium will focus on cellular and molecular mechanobiology, a quickly thriving field contributed by many talented young scholars, as its major scientific topic. In this symposium, we will highlight the current challenges and most exciting breakthroughs in the study of cell adhesion, cell mechanosignaling, molecular binding and molecular mechanosensitivity in physiological functions like stem cell differentiation, immune responses, hemostasis, metastasis, and in related diseases. We will invite outstanding scientists (especially those who have established successful international collaborations) to present their latest discoveries and achievements. The goal is to build a platform for emerging leaders of the field to initiate new ideas and facilitate future personnel exchanges and collaborations on world-class projects. Summary: This symposium focuses on the implementation of various engineering principles in the conception, design, development, analysis and operation of biomedical systems and applications. Authors and presenters are invited to participate in this symposium to expand international cooperation, to develop understanding of bio-engineering principles and methodology and to promote efforts in implementing engineering principles to biomedical systems. Dissemination of knowledge by presenting research results, new developments and novel concepts in developing these systems will serve as the foundation for this symposium program. Summary: This symposium intends to introduce the fundamental-breaking or newest advancements in multiscale biomechanics and mechanobiology, ranging from nano to macro scales, and from molecular to body levels. This symposium also covers the emphasis of biomechanics on both basic sciences and physiology/pathology, reveals the novel developments in research methods and tools, and stimulates multidisciplinary interplays for biomechanical studies. Summary: This symposium will discuss human injury and rehabilitation related biomechanics and mechanobiology problems. A broad topic of injury and rehabilitation biomechanics involving various forms of injury, treatment and rehabilitation will be covered. Scientific discoveries as well as technical methods such as physical intervention, assistive technology, devices design, advanced manufacturing, 3D-Printing, computational simulation, imaging analysis, and mechanical testing will be discussed. Injuries and rehabilitation including but not limited to injury biomechanism, clinical treatment and rehabilitation methods of traumatic brain injury, sports related injury, hard tissue injury, soft tissue injury, etc. Summary: Cancer cells and cancerous tissue have been shown to be characterized by altered stiffnesses in vitro using a number of different approaches. We have developed a technique to make virtual biopsies of tissues and elastic modulus measurements on normal skin and benign and malignant skin lesions. The technique involves use of optical coherence tomography and vibrational analysis to image and measure the resonant frequency of tissues based on the displacement of a tissue during transverse deformation in vivo. The image is made using near-infrared light and the transverse vibrations are achieved by applying a sinosoidal sound wave perpendicular to the tissue surface at a fixed wavelength. The resonant frequency is defined as the frequency of applied sound that causes the tissue displacement to be at a maximum. Our initial results suggest that the type and malignancy of a lesion can be defined by the cellular resonant frequency, the collagen modulus, the peak heights and widths. Summary: This is a symposium for studying cellular scale fluid mechanics for biomedical purposes, which includes researches for the mechanisms of cell-fluid interactions with both simulations and experiments, and practical applications with microfluidics such as rare cell sorting, measurement of mechanical properties of cells, and design of chips for single cell analysis.